“Total political crap,” the only acknowledged gay CEO of a Fortune 500 company called it on “60 Minutes” last Sunday. 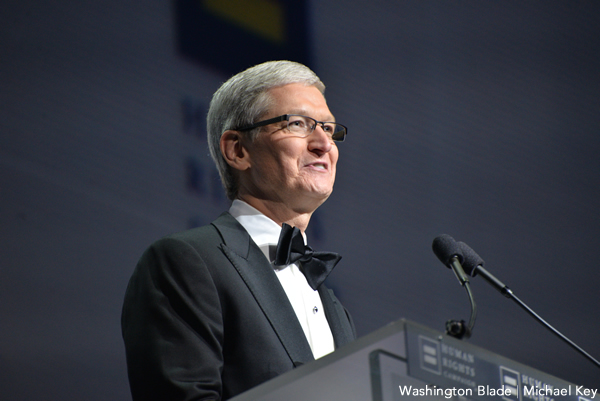 Tim Cook was referring to charges Apple employs a complex and sophisticated scheme to avoid the 40 percent in U.S. taxes it would cost the world’s largest company to repatriate money earned elsewhere. He could have just as easily been referencing D.C.’s whopping 9.4 percent business tax flat rate, reduced last year from the former sky-high 9.975 percent. The rate dropped only from third-worst to fourth-place among states after that initial cut. The next phased-in reduction to 9 percent was scheduled to take effect in 2016, but instead will only go down to 9.2 percent. D.C.’s slow and painful march to merely matching neighboring high-tax Maryland’s 8.25 percent corporate rate is predicated on revenue projections of sufficient surpluses to pay for continuing annual business and personal income tax cuts. The current, and overly conservative, estimate of recurring revenue by District CFO Jeffrey DeWitt was short by a razor-thin 651,000 dollars required to qualify the next minor business tax rate reduction. The tiny shortfall in this first-guess of a projected surplus is only .0093 percent of a total seven billion dollars in local tax receipts. This artificial differential, produced by too cautious of estimates, will undoubtedly be erased by subsequent upward adjustments based on typically higher actual receipts producing commonly significant quarterly surpluses. The estimate also excludes other revenue streams and aggregate under-spending by city government agencies. Add in the federal marginal corporate tax rate of 35 percent, the highest in the developed world, and District businesses continue to face a combined and only partially marginal tax rate of over 45 percent. In comparison, the headline corporate tax rate in adjacent Virginia is only 6 percent, and Democratic Gov. Terry McAuliffe is proposing a reduction to 5.75 percent. McAuliffe hopes to lower the Commonwealth’s already much-lower-than-D.C. rate to remain both regionally and nationally competitive in attracting new business and to retain enterprise currently located there. D.C. Mayor Muriel Bowser could push the D.C. Council to fully enact the scheduled minor reduction in the business tax rate absent the automatic trigger. Bowser can argue what D.C. Council members know – actual tax revenues will more than exceed the amount required to continue the slow pace of too-meager corporate tax reductions on the approved timetable. Mayor Bowser should make that case. In fact, District politicians should both accelerate the planned reductions and further lower the end-result business taxation rate. They could easily do so by ferreting out the known brutal inefficiencies and massive waste in government operations they continue to ignore. Tim Cook is correct. The country can’t compete globally with current corporate tax rates. Likewise, D.C. can’t compete regionally or nationally without a bigger and quicker lowering of business tax rates. More than that, D.C. Council members must stop “layering” new regulatory mandates with extraordinary costs, one on top of the other. An absolutely astonishing spate of new legislative proposals to do just that will further deteriorate the business environment, particularly as the federal government continues to shrink and can no longer be counted on to hyper-inflate the local economy. D.C. should aspire to greater than simply matching the excruciating corporate tax rate of anti-business Maryland. There’s a reason high-earning taxpayers and growing small businesses began fleeing Maryland after former Democratic Gov. Martin O’Malley hiked taxes and even began surcharging rain. It led to a humiliating top-spot loss in the true-blue state by a political party that has lost its way and no longer knows what being business-friendly means. D.C. enterprise is increasingly frustrated and angered by similar policies of the District’s political class. Especially when they find another chunk of coal in their holiday stocking.